I held the stamped envelope, full of spring soccer sign up forms, in the mail slot for a few seconds before letting go—committing to a spring of weekend plans. Sure, I can stand in a river in the rain with no problem, but standing still on a soccer field in the rain sounds excruciating. As I reflect on trying to become a “normal” American parent, I look back on my decision to keep my family as wild as I could for the last ten years, hauling them to the outdoors almost every weekend to explore, find adventure, and to build a foundation that values river places. Yes, some of my intentions of riverside-parenting are selfish, as I’m a trout bum at heart, but I’ve found that my children adore these experiences; and just as fly fishing helps balance my mind, this time together in nature has given my children a chance to find a type of freedom they cannot experience anywhere else. I’m uncertain I can muster the strength to commit to the weekend shackles of soccer season, but I want to encourage you to entertain the idea of committing to hauling your children on your fly-fishing adventures. 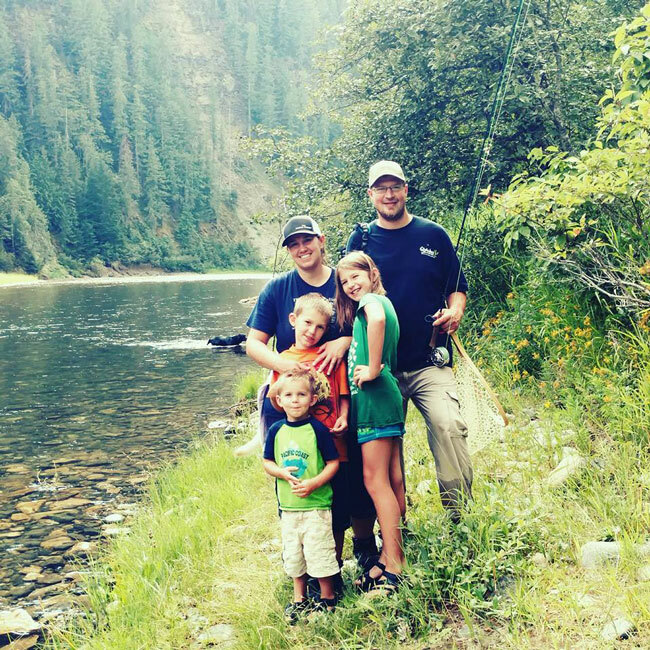 Here are some tips to help you make your family fly-fishing trips memorable. (Notice that I didn’t say “smooth.”) And if anyone has tips for me on how to be a normal soccer parent, let me know. 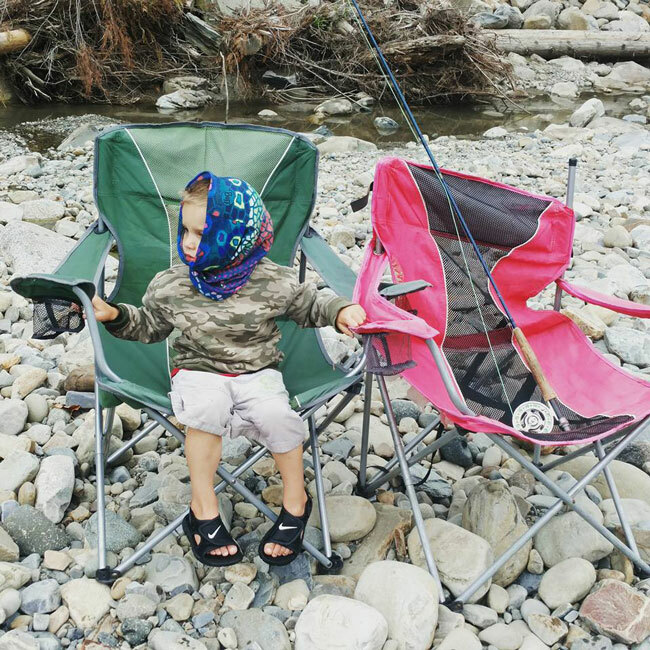 Riverside family outings allow you to bond over a love of the outdoors. 1. Find the perfect spot on the river. This spot needs to meet everyone’s needs: a shallow stretch of river with a slow current, a chunk of sand for the kids to play in, a small pool area for the swimmers to swim when it gets warm, and fishy sections of water above and below where the kids are playing. You may have to drive a while to find this magical stretch of water, but it exists; I promise it’s worth the search. It’s also essential you find a safe stretch of water where you feel comfortable with kids; otherwise you will be stressed out the entire time. 2. Use a tag-team approach. If you can find another pair of parents to join in on the childcare tag-team, it’s a fun idea. One parent can entertain the kiddos, while the other parents fish for a while. Bringing walkie-talkies is a plus, so you can communicate about taking turns. And if one of the parents decides to be a fish addict, you can get in touch with them to bring them back to reality. Kids love to splash around, help net fish, and share in your angling success. 3. Teach your children how to enjoy the river. 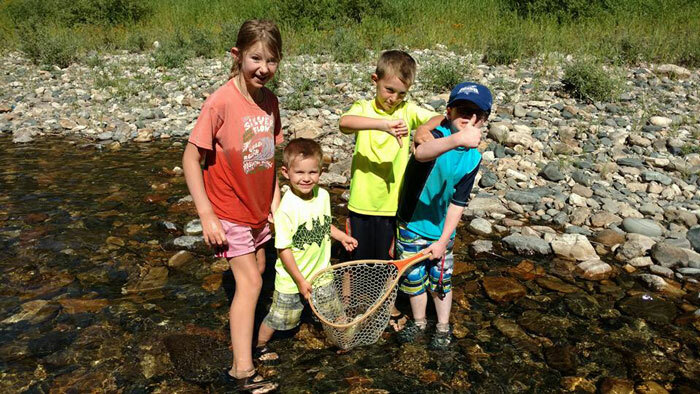 Get them started fly-fishing while they are young by teaching them how to look for aquatic insects under rocks, or sifting the water with a silk screen to pinpoint a hatch. Bring a plastic photo tub to put the fish you catch in, so the kids can examine the fish. Take several moments throughout the day to show your kids how much you love the river; but most importantly, show them how much you love having them there with you. We can always “get our fish on” throughout our lives, but to be able to teach your children how fly-fishing connects them to the outdoors is an honor. When your children near the age of four years old, it’s time to get them their own little 3-weight rod to practice on. Tying flies at home together to try out on the river is also another wonderful activity for families to enjoy together. Bringing the right gear is one of the keys to success. 4. Give the kids time to settle into being river kids. Every time I haul my kids outside fishing, they throw a fit at the beginning and claim they have “nothing to do.” It takes them a while to realize they don’t need to be entertained, and they find creative ways to explore. This may sound harsh, but ignore the kids for a bit, so that they learn how to make up their own ways of interacting with the outdoors, and give them time to unwind from the stress of “what comes next.” If they can’t seem to get started, help build a fort out of sticks or haul out some toy trucks to build a racetrack. They will figure it out; I promise. 5. Don’t set expectations. Do not be surprised if your plans fail, and you spend more time changing diapers or feeding kids than you do wetting a fly. With each stage your children reach, your river time will change; sometimes that change is easier and sometimes more difficult, but always an adventure. There will be moments when it all falls apart, but even then, you will notice a smile on your face and cherish the story you get to share when the kids are older. 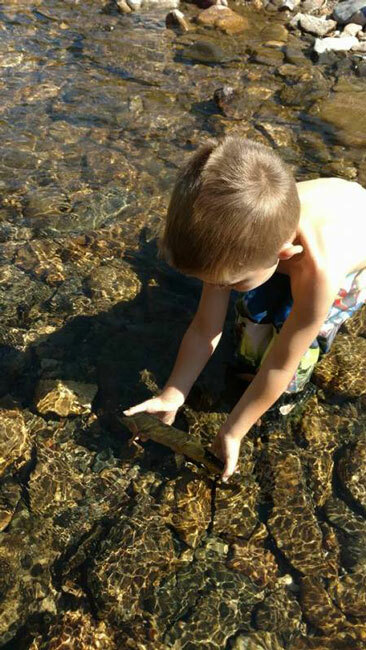 Teaching kids early on how to handle trout makes for good stewards of the resource. Chances are, if you raise riverside kids you will have fly-fishing teenagers, or at least young adults who adore the feeling they get when exploring the great outdoors. And that is always worth the hassle and difficulty of hauling the family to the river. Cheers to raising up a generation of river-keepers. Kaitlin Barnhart is a freelance writer, co-founder of The Mayfly Project, and supporter of 50/50 On the Water. She contributes to a variety of publications and enjoys fishing wild rivers in northern Idaho with her family.